"This is a quick and easy cranberry sauce recipe that will please the entire family. You will never buy canned cranberry sauce again! Prepare up to two days ahead and keep in the refrigerator." Mix cranberries, brown sugar, orange zest, orange juice, and cinnamon sticks together in a saucepan; bring to a boil. 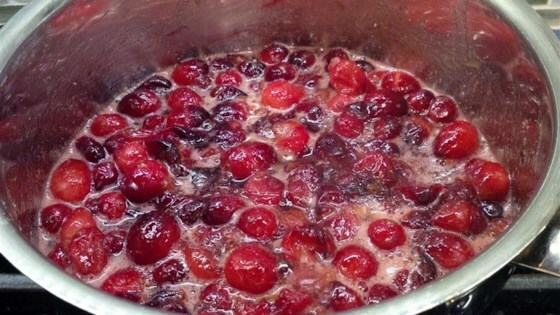 Reduce heat and simmer until cranberries pop and sauce is thickened, about 15 minutes. Transfer sauce to a bowl and refrigerate until chilled, at least 1 hour. Remove cinnamon stick from sauce and serve at room temperature. Watch how to make this wonderful cranberry sauce yourself! I'm sorry, but this recipe is no good. It was lacking in flavor and definitely needs more sugar - way too tart! The proportions are off on this recipe. As written it was bitter! I added another cup of brown sugar and now it's edible. Actually quite good. This is very close to the recipe I remember as a child when my Grandmother & Mother made it.